Products showing the Fair Share label carry a small price premium that is passed directly on to the garment workers in India towards their Living Wage. 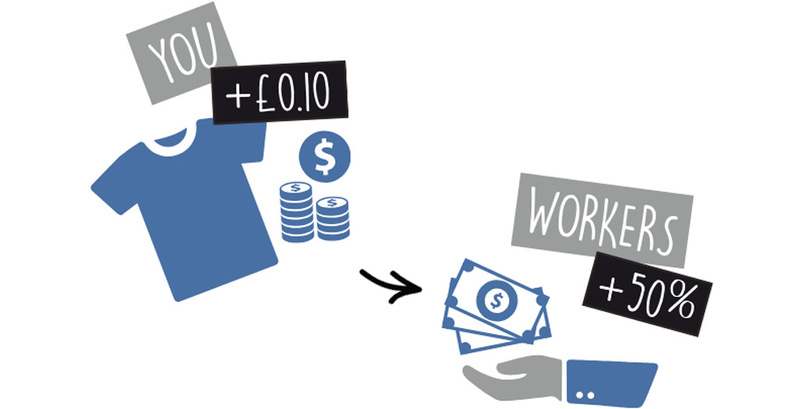 Adding as little as 10p to the price of a T-shirt, or 54p to the price of a hoody, will result in a 50% increase in the wages of the poorest workers at our factory in India. Continental Clothing Co, working together with the Fair Fashion Network and BSD Consulting, has implemented a scheme that aims to deliver a LIVING WAGE for the garment workers at its factory in India. The first stage of the wage increase has come into effect from 1st January 2016 and covers the entire workforce. A benchmark was calculated for minimum earnings required to provide a decent living for a typical family in the area. The difference between the current wages and the living wage was then converted into the additional amount that needs to be paid for each garment produced at the factory. The premium that has been added to the cost of each garment is documented as a separate item and goes directly to the workers with their monthly wages. "I’m very happy about Fair Share, it helps me pay for my daughter’s school." "I can save for my daughter’s marriage." In the absence of an existing calculation that would reliably reflect the realities of living and working in the garment industry in Tirupur in India (where the factory is located), Continental Clothing commenced the project by defining the living wage benchmark specifically in relation to the factory workforce. 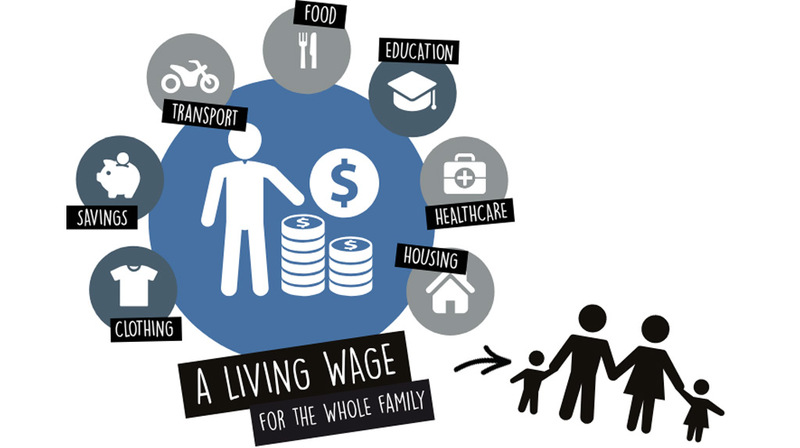 Based on the adopted definition of the living wage and primary research results, a round of discussions was held with representatives from a local NGO, the management and the workers of the factory, to put accurate figures on all the elements of the living costs. The result was a net monthly requirement of 12,116 Indian Rupees (INR) set in December 2015. This equates to a standard shift rate of 466 INR “net money in hand”. This figure was then grossed up to allow for the statutory deductions of 13.75% from the pay slip. Consequently, the FAIR SHARE living wage benchmark for the Tirupur area as of December 2015 was set at 14,048 INR per month (£141 or €191). This benchmark should be reviewed annually to keep track of the changing costs of living. The lowest net wage at the factory for an 8-hour shift was 307 INR after deductions, including guaranteed bonuses but excluding any overtime. At the time of the survey, there were 14 workers (13 helpers and 1 sweeper) on the lowest wage. The highest shift wages were 574 for cutters and 523 for tailors. The average net shift wage was 393 INR. In order to reach the set living wage of 466 INR, the lowest grade wage of 307 INR would have to be increased by 159 rupees in net terms. Of course, with the changing minimum wage levels and any possible variations in the living wage benchmark, this should be re-evaluated annually. Even though the current production covered by the FAIR SHARE scheme would be only 5-10% of the factory’s output in the first year, it was decided that all the factory workers should benefit from the increase in wages rather than only those actively involved, and it should be paid through the monthly pay roll rather than as a one-off bonus, every month, on a permanent basis. The initial orders in the first year would not generate sufficient funds to reach the target living wage level in full, and therefore it was agreed that the available funds should be shared equally amongst all the workers through the pay grades, even if some top earners were already above that level. Giving every worker the same net increase was acceptable to all parties, and it was deemed as an equitable way of distributing the funds. In effect, it means the lowest earners would receive the highest increase in percentage terms. Considering the amount of money the scheme would generate in the first year, the size of the workforce, and in order to ensure adequate provision of funds for every month, the additional amount to be paid to every worker was calculated at 25 rupees per shift, giving a monthly wage increase to every worker of 650 INR. Continental Clothing guaranteed that this additional monthly wage payment would not decrease or stop for as long as the company has a trading relationship with the factory, regardless of the volume of future orders. The scheme will be independently audited by Fair Wear Foundation three months after commencement. Continental Clothing will absorb the cost of initiating the project, defining the methodology and the benchmark, carrying out the research, implementing, reporting, marketing and auditing. The factory will absorb the cost of administering the scheme and covering the additional statutory employer’s contributions to the provident fund. Any further funds generated as a result of increased production volumes would be accumulated in a fund to further increase the wages in the following months until the living wage level is reached for all employees. The longer-term aim of this project is to reach the full living wage for all workers by covering 100% of the factory’s production within the scheme. This objective, however, will depend on the response from the market and the willingness of the retailers and consumers to pay the additional premium. Continental Clothing has committed to fully support the communication and marketing of the scheme in order to achieve a high take up rate for products carrying the premium. The company will also encourage other brands sourcing from the same supply chain to participate in the programme. A more detailed report of the project has been produced by Mark Starmanns of BSD Consulting / Fair Fashion Network and is available here.